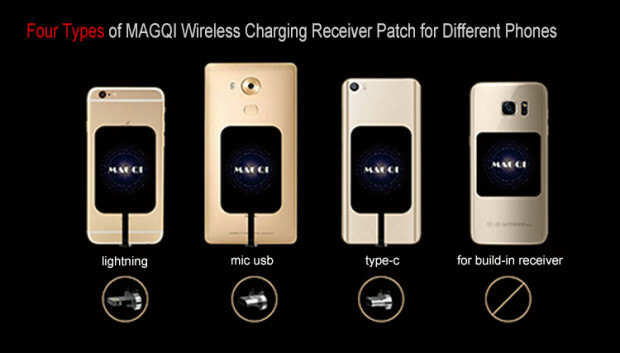 MAGQI is currently up on Indiegogo offering various wireless charging devices. The convenience of wireless charging is more evident when it’s everywhere you go. 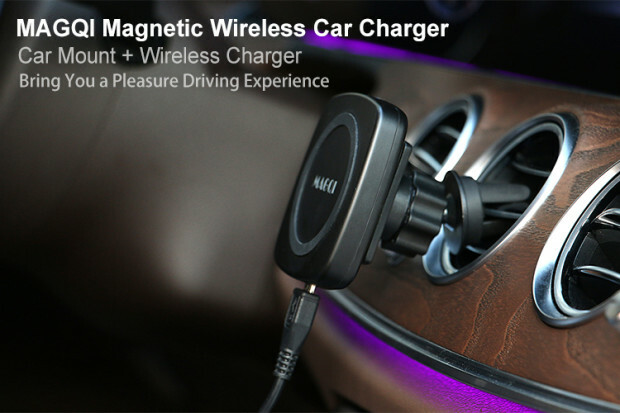 MAGQI offers a set of magnetic wireless charging devices to add some convenience in your life. Let’s check out what gadgets they have available and its features. The desk charger currently available is made in white with a slight tilt to have your device at the optimal level for viewing. As with the other devices that they have, it has 4 magnets around the charging coil. This makes aligning the receiver a breeze and keeps your device steadily on the charger. You can choose to either have your smartphone in portrait or landscape. If you want to move around with the wireless charging phone stand, you can unplug the cord and bring it to another table. If you want to move around with the wireless charging phone stand, you can unplug the cord and bring it to another table. The magnetic wireless charger weighs 240g with dimensions of 65x85x115mm. 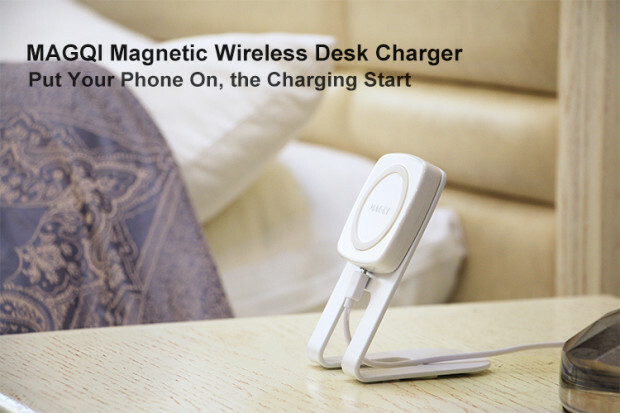 You can use the MAGQI magnetic wireless desk charger with any Qi wireless charging device. For devices without Qi wireless charging built-in, the company also has receivers available which we’ll tackle later. The wireless car charger also doubles as a smartphone car mount. The device clips onto your A/C air vent bracket making the angle perfect while keeping your smartphone and wireless charger cool. The wireless charger can rotate all around to give you the best angle to see your screen. Just like the desk charger counterpart, this also has magnets in it to easily place your smartphone on the mount and to keep it steady. It’s also fairly light at just 75grams. If you want to have your smartphone a little bit higher up for better viewability, there’s also an extra windshield bracket which sticks anywhere on your windshield. You can simply switch the brackets for more convenience. Just like its brothers, this device has built-in magnets along with Qi wireless charging right on top. 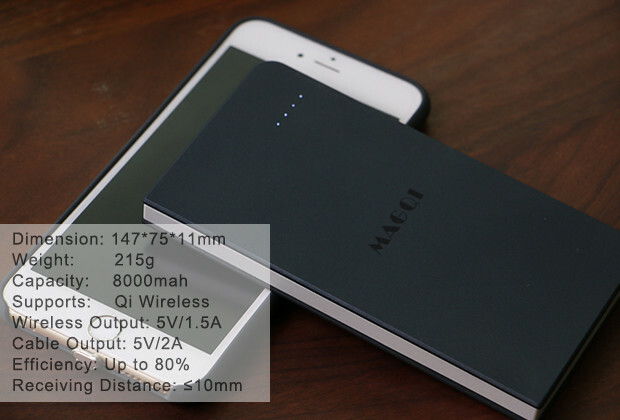 The MAGQI Power Bank will stick right at the back of your smartphone to have it continuously charging. You can simply just leave it on a table or bring it with you in a bag. This keeps the place neat and tidy while saving some space. It can even hold your smartphone when it’s upside down. If needed, there are also 2 USB ports with one offering the Qualcomm 2.0 fast charging standard. This will let you charge devices that don’t currently support Qi wireless charging and if you need to power up multiple devices. The magnetic wireless powerbank has 8000mAh of battery weighing at around 215g making it powerful yet compact. To take full advantage of their products, it is highly recommended to get their patch for your smartphone. They have specific patches for Apple and Android devices with the lightning, Micro-USB, and Type-C ports. Although, for smartphone using Micro-USB, only the ones with the port in the middle will be supported. For smartphones that already have Qi wireless charging built-in, you’ll still need a patch that will stick on the back of your device for the magnets to work. Without this, your smartphone will just slip off the chargers. MAGQI has covered every single place a person can be in. Whether you’re at home, in the office, in your car, or anywhere else, they have a product for your wireless charging needs. Head over to their Indiegogo page to avail their perks! You can get the entire kit at just $85, set it up, and say goodbye to charging cords. I bought this system and never received all of the items. They refuse to send me the pieces required for it to work. They told me to send it back to China, at my cost, without a means of recovering the money given. Don’t waste the money, plus I read it doesn’t work, WHICH I CAN’T TELL BECAUSE I NEVER GOT THE ITEMS ORDERED. Received all parts, 80% don’t work, 20% don’t work properly, I have ask for a refund a number of times, no answers, by aware, this product may damage your battery.